Grow Tents: Do They Make For A Better Grow Room? Ever since we started indoor gardening, people have been asking us why we don’t use grow tents. They assume since we are not using one in our own grow room, we must know something they don’t. There must be a reason why we do not recommend the use of tents. This reasoning is false and we would like to clear that up right here and now. An indoor grow tent with LED lighting. 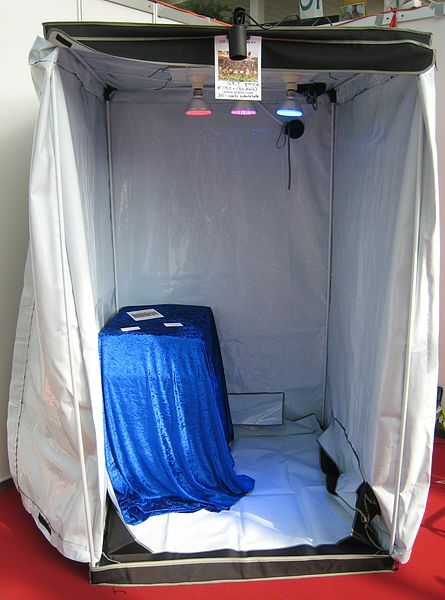 We love grow tents and definitely recommend using them, if they work for your grow operation. That said, we only recommend high quality tents, but more on that later (you can also find a breakdown of popular brands here). First, we would like to explain why we don’t use a grow tent in our basement grow space. The room we use to grow our fruit, vegetables and herbs was already pretty well sealed off to begin with. We did a little work on the walls and have basically created a fully sealed room. We added some ventilation and for all intents and purposes, our room is like a tent itself. There is no need for separate tent. A tent comes in handy when you are only using a small part of a larger room or when you have a room that isn’t sealed off. Tents create a small climate-controlled space in which to grow your plants. Since we already had that, we had no need for a grow tent. But don’t let that lead you to believe that we don’t recommend them. We definitely do. As mentioned above, quality does play a large part. There are so many tents out there but only a few of them are any good. Unfortunately, those good ones will cost you a lot of money. That is actually another reason we don’t have a grow tent. We don’t need it, so we can save a lot of money by not getting one. If they were much cheaper, we would probably have one anyways, despite our room already being very similar to a tent, because it would add that extra layer of insulation and protection. So which company do we recommend? Well, that answer is simple: Gorrilla grow tents. This company makes by far the highest quality tents. Their material is a higher quality, the construction is a higher-quality, everything about them is better than the other tents on the market. That said, the prices are also much higher. If you don’t have the money to spare, go ahead and go with a cheaper tent, but know that you will have some issues. Zippers will stick, seals will be break and you’ll have to reseal, the fabric might tear, the lights you hang in there can’t be too heavy, etc. Saving money will create more trouble for you, but if you don’t have the money to begin with, a cheap tent is better than no tent, if you are in a situation where you absolutely need a grow tent. Another nice thing about Gorrilla grow tents is that they are very tall. This gives you a lot of space to hang your lights, which is especially important if you’re using an HID lighting system. With LED lights, height is not as important, but it is still nice to have all that extra room in a tent. They do offer a Shorty line of tents as well, that gives you less vertical space but is ideal for short grow spaces like an attic. They also have a Lite line, which allows you to save a lot of money. The Lite line is made from lighter material, as the name might suggest, and thus costs a lot less. It is not quite as sturdy as the standard line of tents, but it is still better than anything else on the market. And, you save a ton of money. So don’t worry so much about what we are doing. We’re growing in our way because it works for us. We don’t need a tent, so we don’t have one, but many of you who have written to us and demanded to know why we don’t recommend tents are doing so because you are in a situation where you absolutely need to grow in a tent and you know it. And for some reason you want our permission to use one. Why? If you need a tent, use it. We can help you by recommending a brand, sure, but please don’t take our word as gospel. The only difference between us and you is that we started growing indoors earlier. That’s it. And we started a blog, of course. But other than that we’re really the same. Yes, you can and should learn from our mistakes and that is why we created this blog, to help out others so they don’t make the same mistakes we did. But don’t rely on us exclusively. If you disagree with our advice, go with your gut. In this instance, that means getting a grow tent if you really need one. And where you can follow our recommendation completely is in getting a Gorrilla tent. You will not regret it. If you can’t afford Gorilla and want something cheaper, try Walmart. They have a decent selection. OMG, you FINALLY started a blog! I’ve been telling you to do this for years! I look forward to reading all about your indoor gardening adventures. I still think you should write about your dog too, though. He’s a psycho and makes for endless hilarious material. But I guess you want to help people instead…..
Of course! You know I always do exactly what you tell me. It just takes a while sometimes…..